SIMEK yard in Flekkefjord has been commissioned to deliver a PSV for Atlantic Offshore. 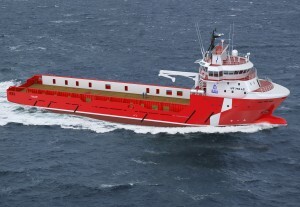 The new vessel, which will be delivered in April 2013, ensures continued employment of up to 60 employees at the yard. Atlantic Offshore operates 26 vessels and large parts of the business is related to the North Sea basin. The company is located at Sotra outside Bergen and has around 550 employees. – Atlantic Offshore is an exciting new customer for us. The ship we are building contains the most recent technology. The ship will be built inside, and we believe that further enhances the quality of the new building, says CEO Øyvind Iversen at SIMEK. The contract secures work for up to 60 employees over the next year. The new vessel is a UT 755 LC by 710 square meters deck and has the most modern of technical devices and solutions. The vessel is 76.6 meters long and 16 meters in width. Currently, Atlantic Offshore do not have a contract for the new vessel. – Based on the activity and demand in offshore markets internationally, it is highly unlikely that this ship will be without a contract. We assume that the market is still growing, and it is also in line with both internal and external analyses, says CEO Roy Wareberg Atlantic Offshore. The company has this year already launched two new ships, and after the summer Bergen Group will deliver their third newbuilding in 2012. Overall, Atlantic Offshore have invested over a billion in renewal of the fleet. – A modern fleet provides an competitive advantage. Operators place considerable emphasis on new vessels with the highest certifications in safety and environment, says Wareberg.